1. What will I need to bring on a fishing excursion? Bring the valid fishing licenses for all members of your fishing party, a form of payment on the remainder of the balance, and clothing and other materials to be comfortable based on the weather forecast. I supply all fishing bait, tackle, life jackets, fishing equipment, and other boat items. 2. What forms of payment are acceptable on the remainder of the balance at departure? You can pay balance remainders using cash or credit card. The balance must be paid at trip departure. 3. What happens if there is bad weather? Captain Steve decides if the weather is too bad to go out or continue fishing. If there is lightning or dangerous conditions at departure, patrons will receive a full refund. If part of a trip is completed, a refund based on the pro-rated remainder of the trip will be issued. Cancellations for reasons other than weather are accepted and full refunds are given before 48 hours of a trip. Within 48 hours of a trip, we can try to schedule a new fishing time, but deposit refunds will no longer be given. To schedule a new time, half of the remaining balance will need to be made as a deposit. 5. What time do we meet for a trip? This depends on the season. I will let you know the exact time to meet in my e-mail reply/greeting after you have booked. Generally, morning trips depart between 6:00 AM and 7:00 AM. Twilight trips depart between 6:30 PM to 7:00 P.M. Early spring and late fall trips might depart much earlier depending on conditions. The time we meet is the time the trip starts. Please also note that early morning and late evening are usually the best times for fishing. 6. What happens if I show up without a valid fishing license? If one of the lake's rangers does a spot check of our boat for fishing licenses, you will be ticketed for not having a fishing license. The website for purchasing a fishing license is http://www.ncwildlife.org/Licensing.aspx . 7. Can I drink alcohol on the fishing trips? I ask that you not drink alcohol on the fishing trips. This is for your safety. 8. Can I keep the fish I catch? You can keep the fish as long as they are within the lake's size and bag limits and you have the experience and capability to clean the fish. I do not clean fish for my clients. 9. What kinds of fish will we catch? I recommend reading my fishing/blog report shortly before your trip to see what is biting. We regularly catch largemouth bass, smallmouth bass, white bass, yellow perch, longear sunfish and bluegill. 10. What kind of boat is "Lure of the Lake"? I guide from deck boat that holds up to 12 people. I accept up to 8 people in a group. This sporty yet spacious boat has a flat bottom for great balance on board as well as easy entry/exit. It has wide ends with two pedestal seats per end for two people on each end and up to four people total to easily fish. The interior seats are couch style. The boat has a bimini top to protect us from the weather. There is also a table, sink, and other amenities on board. 11. I notice that your wife and sons are in many photos with numerous different boats and backgrounds. Do you fish other places besides Lake Lure? My wife and sons enjoy fishing with me, and we fish numerous lakes and waterways including Lake Lure. For my guiding business, I only fish Lake Lure because it has the best fishing. 12. How early should I arrive? Arrive early enough so that you are all ready to board the boat upon my arrival. The best fishing is first thing in the morning and right before dark. The sooner we depart, the more fish we can catch. 14. Where do we meet? We meet at the Town Park (Washburn Marina) area, Rumbling Bald area, or a specified spot you have chosen on the lake. 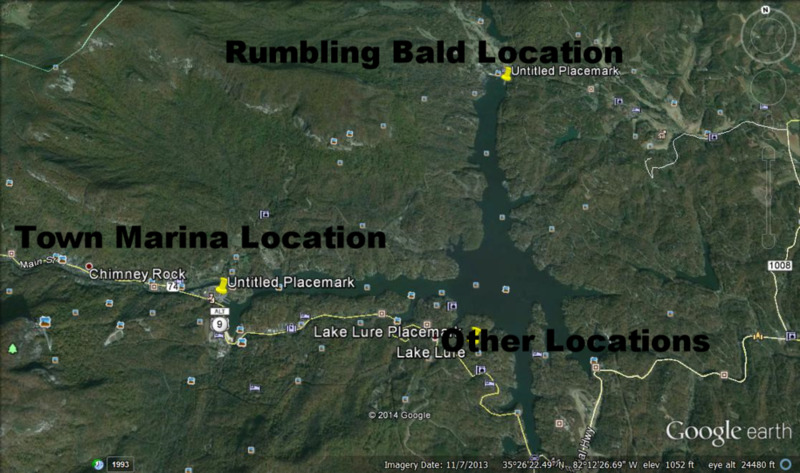 Rumbling Bald - We'll send specifics for this if you choose this area. Other Location - You will indicate the address when you fill out the check out form upon completion of reserving your trip.